A magnificent and important pair of porcelain vases by the Imperial Porcelain Factory will highlight Christie's autumn's Russian Art Week in London, estimated at £1,700,000-2,200,000 (up to $3.48m). In their 28 November Russian Art Sale, Christie's are offering perhaps the finest and grandest pair of Russian porcelain vases to appear at auction in recent memory. Over the years, the company has been entrusted with the sale of numerous important pairs of Russian vases and have achieved the highest price ever paid at auction for a pair of Russian porcelain vases in 2006. 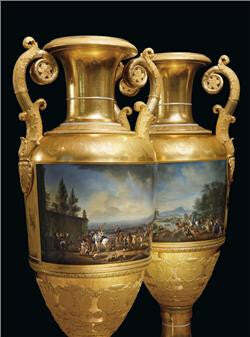 These magnificent vases were presented by Emperor Nicholas I to Karl Ludwig Graf von Ficquelmont (1777-1857), who served as the Austrian Ambassador Extraordinaire to the Russian court from 1829-1839. Graf von Ficquelmont was one of Chancellor Metternich's closest advisors and exercised substantial influence at both the Austrian and Russian courts. After a decade of service, Graf von Ficquelmont was called back to Vienna in 1839 to assume the duties of Foreign Office during the absence of Prince Metternich. Given the impressive size and date of this pair of vases, they were presented out of recognition for his exceptional service to the Imperial court. Under Emperor Nicholas I (1796-1855), a great patron of the Russian arts, the production of the Imperial Porcelain Factory reached its apogee and works from this period are the finest examples of palace and presentation vases produced. Works of such grandeur were mainly executed for presentation, and thus reflected the Emperor's personal preferences in their design and decoration. These vases were often presented directly to the Imperial family on special occasions, such as Christmas and Easter, and were used to adorn the vast palaces, private mansions and exhibition pavilions built during the period. Vases of this size and virtuoso execution were also commissioned by the Emperor as important presentation gifts to heads of foreign royal families and to foreign diplomats, as recognition for exceptional service. During the reign of Nicholas I, many of the vases produced by the Imperial Porcelain Factory were decorated with copies of Old Master paintings, by using the middle section of the vase as a canvas. The paintings were typically scaled-down, faithful copies of original works in the Imperial Hermitage, the Academy of Arts or from collections in the Imperial palaces in the vicinity of St Petersburg. The names of both the original artist and factory artist were usually added to the vase paintings. The remarkably detailed, colourful and varied paintings on the present vases are signed by the Imperial Porcelain Factory artist M. Kornilov (d. 1852) and painted after canvases by the seventeenth-century Dutch painter, Philips Wouwerman (1619-1668), who was one of themost versatile and prolific artists of the Dutch Golden Age. Embedded in the artistic environment and tradition of his home town of Haarlem, Wouwerman made an important and highly influential contribution to the canon of seventeenth-century Dutch painting. His pictures were in demand during his lifetime, but even more sought after in the 18th century. Throughout Europe, formerly princely art collections like in Dresden and St. Petersburg still bear witness to this widespread and great admiration of Wouwerman's elegant and picturesque refined works of art. One of the pair, painted in 1835, is decorated after Wouwerman's detailed seventeenth-century genre scene, A Stag Hunt. Thepainting was acquired by Empress Catherine II in 1772, forming the foundation of the State Hermitage Museum and remains in the collection to this day. The distinguished provenance of Wouwerman's original painting reflects the enduring aesthetic appeal of the canvas reproduced on the present vase. Its vibrant painting by the Imperial Porcelain Factory artist, Kornilov, expertly captures the broad, atmospheric landscape and richly coloured noble vignettes of Wouwerman's original, embodying the compositional and tonal characteristics of his late works. The painted scene on the second vase, dated 1836, is after Wouwerman's canvas Departure for the Chase and similarlydemonstrates his skill in painting both figures and landscapes on a grand scale. The original painting is now held in the collection of the Gemäldegalerie Alter Meister, Dresden. The original canvas, executed between 1665 and 1668, was acquired from the Parisian collection of Ambassador Bourbet de Vaux by August III, Elector of Saxonia and King of Poland (1693-1763) in 1749 and subsequently entered the Royal Picture Gallery's collection in Dresden. The Dresden painting forms an impressive pendant to the Hermitage example, both taking as their subject Wouwerman's signature theme of the hunt. Again the factory artist has acutely observed the fashionable figures and dynamic horses of Wouwerman's original on the present vase.